Since William Hill was founded backed in 1934 it has become one of Europe's most recognised and trusted brands. 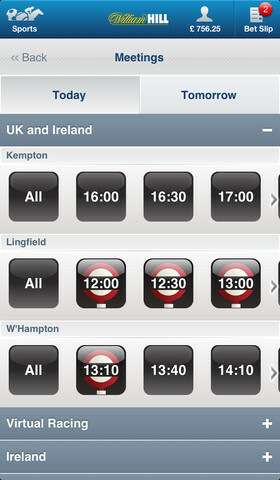 They have developed a range of top quality iPhone, iPad, Android, Blackberry & Window Phone apps. One of Europe's oldest and most trusted bookmakers with over 16,000 staff. The United Kingdom's second most popular sports betting app. Take advantage of exclusive betting offers only available to mobile customers. Serving hundreds of thousands of clients yearly through its extensive network of high street bookmakers, William Hill has long been one of the UK’s largest and most traditional betting establishments with over 70 years’ bookmaking experience. Moving with the times, however, the company now boasts an online gambling presence offering extensive sports betting options and has further moved into the mobile and tablet market. With almost a quarter of its online customers now placing bets on the move, punting from the pub or the terraces via mobile has taken off in a big way. 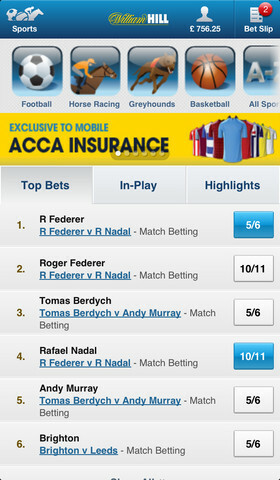 It allows clients to bet anytime, anywhere on any sporting event available to customers online via Williamhill.com. Options include in-play betting, accumulators and ‘hot picks’, essentially round ups of the most popular bets being laid on particular events. The main William Hill sports app features come from quick access to in-play markets, selected matches and races and top bets. 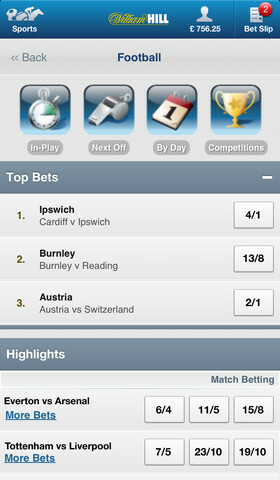 In-play betting via mobile provides an extensive range of markets and options and is easy to use. William Hill offer more in-play markets than any other mobile bookmaker. Mobile customers are invited to bet live in-running on a wide range of sporting events, including football, soccer, tennis, basketball, horse racing, snooker, volleyball, rugby and many more. 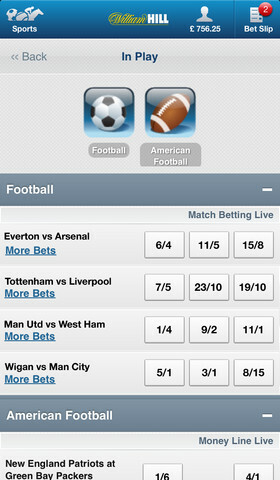 The free William Hill app is also great for getting the latest football results across a huge range of sports in real-time. Even though William Hill do not stream live horse races via their iPhone and Android apps like Bet365, horse racing fans are still well catered for thanks to a range of exclusive horse race betting offers that are only available to William Hill mobile customers. William Hill have also partnered with the Racing Post to bring their customers insider knowledge and information on all upcoming races. The Racing Post also provide William Hill mobile customers with expert tips and analysis from leading industry experts through their "Racing Post Verdict" section, which can be accessed from the top of each racecard. The Racing Posts "Spotlight" section gives punters a list of the top 10 backed horses allowing them to quickly place bets on the most backed horses at any given time. Horse racing specials are also offered on upcoming events such as the Cheltenham Festival, Royal Ascot and the Grand National. Another brand new innovation that William Hill have introduced is the ability to wager on virtual football games as well as horse and greyhound racing. Thanks to the new William Hill virtual sportsbook there is always something exciting to bet on 24/7. The graphics are ultra realistic with new races and games kicking off every couple of minutes. Bets start at just 3p with prizepools of £25,000 up for grabs. In addition, casino, bingo and games features are available on the move and accessed easily via the app. 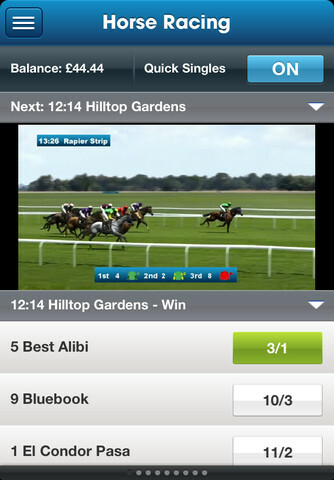 While the app may lack live sports streaming, William Hill have developed a solid mobile application that looks great and will easily cater for the demands of most punters. Customers having a flutter on the go via the sports app are met by a simple layout with the main sports markets listed across the top of the screen and top bets at the time of access listed vertically down the page. Additional buttons above provide simple and clear access to the top bets tab, in-play betting and highlighted sporting events options. One improvement we would like to see is the addition of the time and date of particular upcoming events, which appears to be sadly lacking in this current version. Granted, this is unlikely to be a major problem for punters accessing the app with a specific event or bet in mind, but for those browsing more speculatively this is frustrating as customers are required to look elsewhere to ascertain when the match or race is taking place; it’s an unusual punter who doesn’t want to know as soon as possible how his bet has fared! Log in is simply done via an easily located tab on the top right of the screen. A betslip tab also enables you to review your bets at the click of a button with the tab indicating at a glance the number of bets currently placed. This is a simple but effective design that works well. Overall, the site is looks good and navigation is generally straightforward and quick. William Hill tend to vary their sign-up bonuses unlike competitors who consistently give £200 worth of FREE BETS to new customers. William Hill also like to offer incentives to download and bet via the sports app in the form of the mobile exclusive offers, which we discuss in more detail in the Betting and Markets section below. 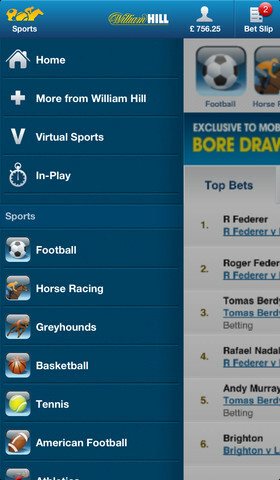 The William Hill mobile app allows customers to bet on all the markets and all the sports available online via the William Hill web site. This provides access to pretty much every sporting event that you are likely to want to bet on, as well as many that you would never dream of going near; a lack of sports markets options there is not! It further boasts that it provides access to more in-play markets than anyone else. Significantly, William Hill offers certain price promises and money back offers exclusively to mobile users only. A ‘bore draw’ money back guarantee, for example, promises to refund all losing correct score and double result bets on 0-0 soccer games in the form of a free bet. This applies to single bets up to £50/50 Euro placed via a mobile handset and excludes in-play bets placed. In addition, the ‘Goal Scorer Second Chance’ promise guarantees that if your chosen first goal scorer doesn't score the first goal, but scores the second goal, William Hill will refund the losing stake in the form of a free bet. Again, this is only available to single bets placed via a mobile handset and does not apply to in-play bets and is subject to a maximum free bet of £50/50 Euro per bet per match. For those partial to a football accumulator, William Hill promises to refund your stake in the form of a free bet on all accumulators involving five teams or more where only one team has let you down. Again, this offer is made available to mobile gamblers only. For racing fans, there is a further mobile-exclusive offer. The ‘winning distance’ bonus rewards clear winners by adding an additional bonus to winnings. Horses winning by 10 lengths or more will receive a 10% bonus and 20 lengths or more attracts an extra 20% on winnings. The offer applies to win or each way single bets and, significantly, only applies to unnamed favourites. Bets must be placed on the day of the race to be eligible and are subject to a maximum bonus of £50/50 Euro. Additionally for race punters, the ’11 for 10 Yankee’ offer provides a money back guarantee on all Yankee bets placed via a mobile handset. £1/1 Euro will be refunded regardless of returns for every £1 Yankee placed. These offers provide a nice incentive to betting via your mobile handset on the move rather than online via the William Hill website. Support for customers via the app comes in the form of a small help button located at the bottom of the screen. Account issues or queries regarding bets can be raised over the phone and customers are given two help numbers to call when clicking on the help button. This is limited compared with online via the website where users can also email or have a live chat with a customer services adviser. Additionally, the information contained in the ‘frequently asked questions’ section available via the website is not accessible via mobile handset. It would have been helpful to also have these options available to mobile customers so as to avoid the need for a phone call in every case, although understandably clients may wish to talk to someone in person when dealing with account issues. 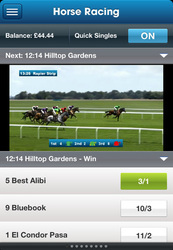 The William Hill Sportsapp is a simple, easy to use app that will meet the needs of the vast majority of punters. Although there are some minor gripes, it does what it says on the tin and will be more than sufficient for most. The mobile exclusive offers available on the markets are a nice touch and provide an extra incentive to those wishing to punt on the move.